In 1768, local boy, Captain James Cook, set sail on the first of his voyages to the Pacific. He would return 3 years later having made a significant impact on our understanding of navigation, astronomy, geology, botany, nutrition and cartography, staking his place in the history books. In Whitby he is a local hero and in July 2018 the Cook250 festival celebrated his life and achievements. That first voyage, though, also had an impact on the culture and identity of the indigenous Pacific people that is still felt today. North Yorkshire Library and Information Service successfully applied for an Arts Council grant to work with Scarborough-based art and science organisation Invisible Dust, the North Yorkshire County Record Office and volunteers from Whitby Library. The result was Encounters. Invisible Dust is an Arts Council National Portfolio Organisation (NPO) with an impressive track record working with leading artists and scientists to produce unique and exciting works of contemporary art, exploring issues around the environment and climate change. Partnering with them enabled us to increase our artistic ambitions and work with artists with international credentials. Artists Ahilapalapa (Ahi) Rands and Fiona MacDonald: Feral Practice created 2 new commissions for Whitby Library, exploring the scientific and artistic impacts of Cook’s voyage and the shared histories of encounter between Cook and the Peoples of the Pacific. When planning the project, as well as raising the profile of the library as a cultural partner and venue, we wanted to demonstrate the continuing relevance of public libraries in providing access to ideas and expanding knowledge of the world. Through Ahi and Fiona’s’ works we were able to bring to the festival a contribution to the contemporary discourse around James Cook, and debates on topics around biodiversity and indigenous peoples. New Zealand artist Ahi created The Oceanic Reading Room, introducing visitors to new ways in which knowledge and learning is gathered and shared by some of the indigenous peoples from the Pacific Islands. It took the form of film, plants, maps, books, quotations and interviews and the creation of a library within a library, a comfortable and welcoming space in which to explore art, science and research from a non-Western perspective. Her work challenged the popular image of Cook as hero and explored the wider and continuing impact his voyage had on the peoples, cultures and environments he encountered. Plant Hunting was the work created by artist Fiona Macdonald - an artistic and scientific exploration, inspired by that undertaken by botanists Joseph Banks and Daniel Solander, and artist Sydney Parkinson, who accompanied Cook on the Endeavour voyage. Plant Hunting was an immersive installation examining plants that grow in Whitby today, but have their origins in the Pacific. 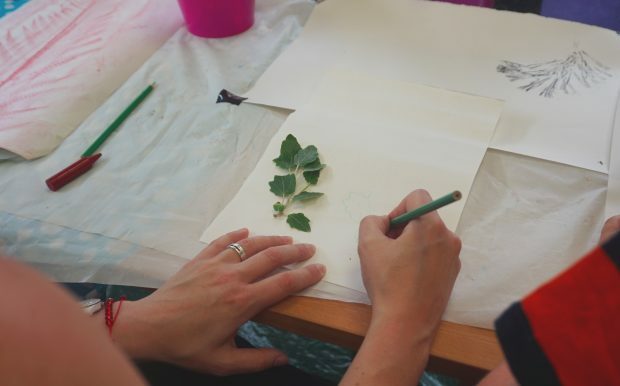 Alongside personal visual investigations, Fiona invited local experts, who had a specific perspective and interest in plants, to describe these same plants using the technical language of their discipline. 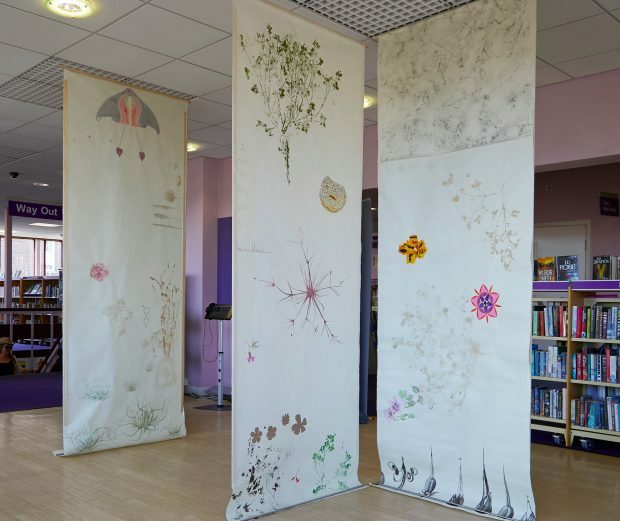 The research developed into 4 visually striking floor length works that hung from the ceiling of the library and a sound piece that investigated different ways of talking about plants. Other strands to the Encounters project included an exciting schools workshop programme developed by Fiona Macdonald for Caedmon College and Eskdale School to engage more young people in the project. Six pupils from the schools travelled from Whitby to London visit the Royal Society, British Museum, Kew Gardens and the National Maritime Museum. They undertook their own research into Cook before setting sail for home on the Tall Ship Atyla (with additional funding support from North Yorkshire County Council councillors’ locality budgets), both crewing the ship and working with Fiona, and Natasha Pulley, award-winning author of the Watchmaker of Filigree Street, to create a unique record of their journey through film, drawing and writing. They presented their work and delivered a talk about their experiences to a packed audience at the library on their return. A further strand was Archive Explorers. Whitby library is supported by a team of volunteers who are essential in maintaining opening hours and delivering services. We wanted them to make their own contribution to the Cook Festival. 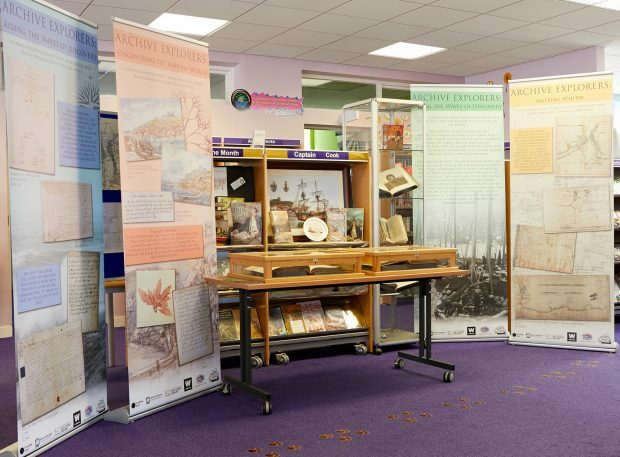 Archive Explorers introduced them to the resources of the County Record Office and they curated their own exhibition exploring Whitby’s past and the natural world at the time of Captain Cook. On their visits, the volunteers gained behind-the-scenes access to maps, sketches, recipes, historical records and other material that put into sharp contrast the changes in the town over 250 years. 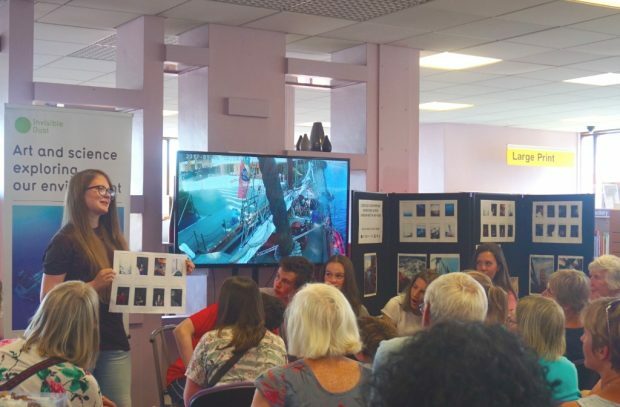 The opening of Encounters during the festival weekend was accompanied by a lively programme of events including a talk from Dr William Frame, British Library Curator of James Cook: The Voyages. Particularly important was the space we were able to provide for Ahi and some of her collaborators to discuss with the audience highly personal responses to colonialism and its impact on people’s lives. 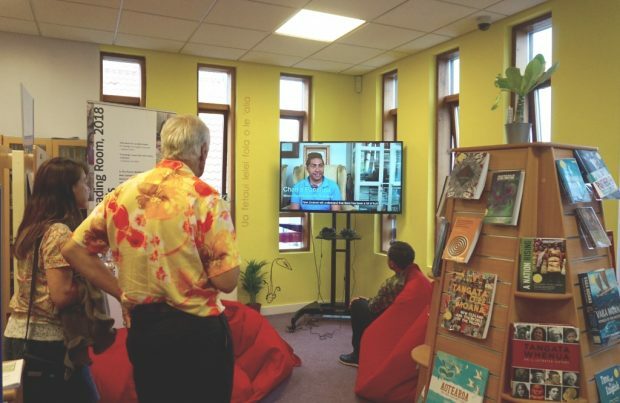 These events allowed people to directly engage with the project and brought new audiences into the library. The Encounters exhibition ran from 8 July to 24 August and was seen by over 11,000 visitors to the library. Visitors were positive, with one commenting how the opening weekend made her “think more about different perspectives on history”. Another commented, “I will further pursue and explore creating art to enrich my everyday life”. For her installation, Ahi had sourced from New Zealand a collection of books by indigenous Pacific Island writers, including rare and out-of-print editions. She has donated these books to Whitby library and they now form a new and significant Pacific Collection providing an alternative, non- western view of Pacific history. It is our intention to build on the relationship we have developed with local secondary schools and use this collection alongside our other resources to contribute to the understanding of Cook and his legacy. The project enabled Whitby library to collaborate and benefit from the knowledge and experience of a leading arts organisation, helping us to develop our own programming and curation skills, raise our artistic aspirations and use the library space to showcase quality art to our customers. 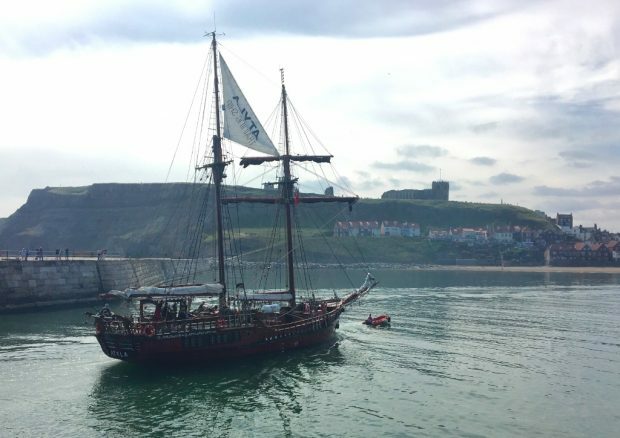 We have been asked to provide content to a Whitby festival in 2019 and are already working with our partners and volunteers to plan our contribution. To find out about other activities in libraries across North Yorkshire, follow them on twitter, on facebook, or look at their website.